Why Is Teaching Worth It? So… why is teaching worth it? We asked our readers in one of our latest emails and our inbox was overwhelmed with heartfelt responses. I’ve compiled just a few of those responses into this post. It turns out, there are SO many reasons why teaching is worth it! “Teaching is worth it because KIDS ARE WORTH IT!” –Lisa R.
“I teach Art at a catholic grade school and for me, teaching is about helping the children feel good about themselves and encourage them to create up to their ability. It’s fun to see a child who feels they cannot do something with a little encouragement succeed. Since I have the kids K-5, it’s great seeing their progress each year. For me, it’s all about the kids. “–Judy Y. “Teaching is worth it because kids are awesome! They always want to please you and they are so curious about the world.” –Rachel S.
“Teaching is worth it because even on the worst and most frustrating days I know that I have 28 geniuses counting on me to love them and teach them no matter what. Teaching is worth it because those 28 kiddos are the most forgiving, honest people I will ever know.” -Brakae C.
“Teaching is most definitely worth it because when that one quiet student gets involved and is excited about going to school and then wants to tell you about everything they’ve done and learned, it just makes your heart melt. A teacher gets to see a child grow not just academically but socially and emotionally. No other job can do that!”–Kelly M.
“I know teaching is worth it because there is nothing in the world like the smile on a child’s face when they finally get what it is they’ve been working on with your help and instruction! 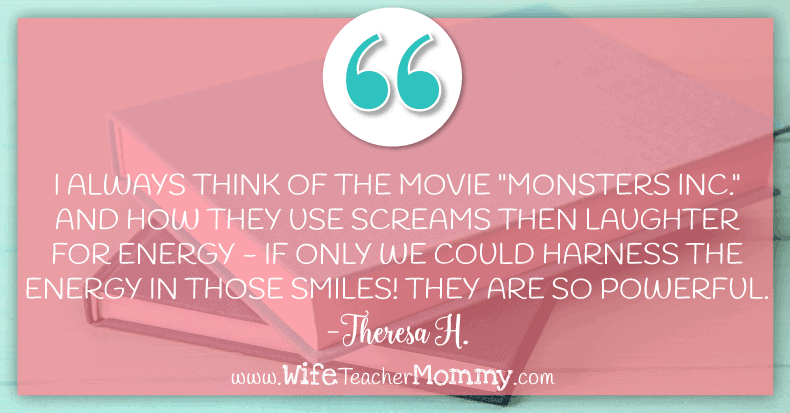 I always think of the movie “Monsters Inc.” and how they use screams then laughter for energy – if only we could harness the energy in those smiles! They are so powerful.” –Theresa H.
“Being a special education teacher is worth it because I get to be the one to convince my students that they CAN learn and they CAN be successful. 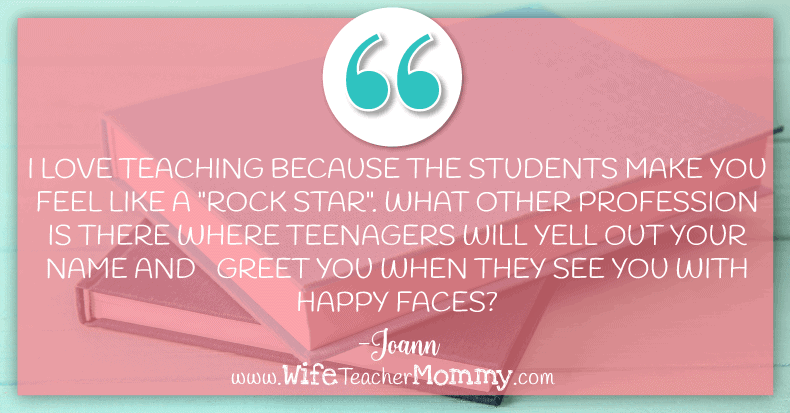 I love to see the relief and hope in the faces of my students and their parents.” –Julie P.
“Teaching is TOTALLY worth it when you see a face light up with a smile, and you KNOW that child has just understood something you have been trying to explain to them or they have been struggling with. It’s truly a “light bulb” moment and fuels me for weeks!” –Mim B. “Why is teaching worth it? …Knowing that in some way, whether it be educationally or emotionally, you have changed their life. Loving a new set of 20 something kids every year, and making sure they know that when they enter your classroom, they are the most important person there that day.” –Nina A. “Teaching is worth it because I have the ability to mold the future. I help my students decide whether to be teachers, doctors, lawyers, etc. in my classroom because they know they can accomplish anything they set their mind to. That is why teaching is worth it. I’m helping to be the change.” –Amanda P.
“As a teacher I am creating a future not only for my students, but for myself! I am creating self-confident students who will one day become a leader in my community, state, nation and world!” –Alecia C.
“I think teaching is worth it because teachers create all other professions! Teachers are literally the backs a student stands on to achieve whatever profession they dream of! We do this with the knowledge that we can help others achieve what we could never imagine!” –Rachel B. “I believe teaching is worth it because of the difference we make in the children’s lives. I work with low economic families and I can not tell you how much my classroom parents appreciate the extra effort I give to their students at school and ways for them to help their child at home.” –Jessica K.
“Teaching is worth it to me because some children are not getting the love and support at home. I teach in a high poverty area and the best things we can do for the kids is show them love and simply talk to them. Teaching is worth it to me because I see how they look up to us and love us back.” –Courtney W.
“Teaching is worth it because my kids are worth it. 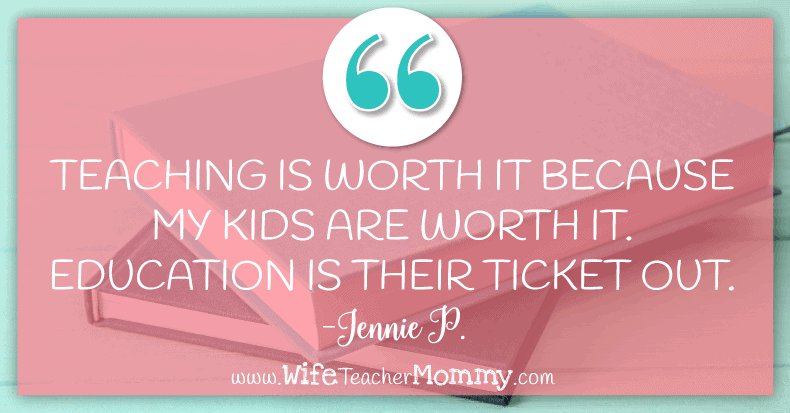 Education is their ticket out.” -Jennie P.
“I think teaching is worth it because we become the student’s second parents and for some we become the only parent they may ever have. We shape and mold them into the people they will become through our consistent love and giving them the opportunity to learn and be their true selves. We are their support systems!” –Kaitlin H.
“I think teaching is worth it because children now days don’t have it the same as we did growing up. I believe they face more challenges. Some have a very difficult home life and don’t get the attention and nuturing they need. So we get to be the ones to give them the attention and nuturing, and to be the ones to help them succeed in their education so they can succeed in their adult life. ” –Denise L.
“Teaching is worth it because adults can learn a lot from their students. You can also empathize with some of your kiddos because you may have gone through the same experience and help them get through the rough patches of their life. Mostly, teaching keeps you young; the kids are just want to learn, share, be happy, be safe and be loved. Most of them come from environments that do not provide this, and we teachers may be the one person that makes their lives a little safer, and little happier.” –Irene J. “This is my first year being on the other side of the desk, teaching! Although I’m now teaching students, I find myself in a familiar setting, still learning. All my life I’ve been learning. Learning how to read, write, play sports, and also learned how to teach students to learn. I feel as a teacher, even though I’m teaching students, I’m still learning many things. I think teaching is worth it because students will always learn and if we give them the tools and concepts of how to always learn they will succeed in life. Just by being constant learners, we as teachers can give students that skill and they can succeed with whatever career path they choose. I think being a role model and showing students they are never too old to learn can make the world a better place again. That’s what makes teaching worth it!” –Maranda J. “Why is teaching worth it? The students, the magic of their learning, their laughs and the relationships you build with them. I spent three years outside of the classroom as a literacy coach for our county; I’m back in the classroom this year and love it. I smile everyday on the way to work and there isn’t a morning that I get up and don’t want to be there with them, learning and growing.” –Shelly K.
“…I also love making the relationships with the kids and watching those relationships continue throughout their elementary (and sometimes even through high school)….I run into students at Walmart or the grocery store and they come up to me and give me hugs. Knowing that I’ve made a difference in their lives makes me feel good.” –Mary C.
“I continue to ask myself that each and every day. With all the added paperwork, on top of teaching, it can take its toll on health and family… I know I make a difference, even if it is only a hug to a former student each and every morning, taking the time to ask a student how his weekend was with his dad, or just sitting with a child while they tell me story. I act as a parent and teacher most days. It’s the hardest job, but in my eyes, the most rewarding job a person could have! (besides being a parent).” –Ann B. 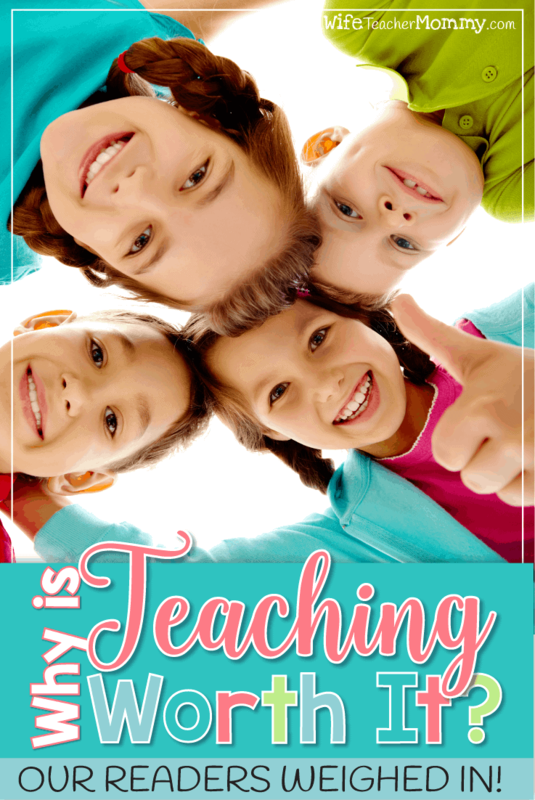 “Teaching is worth it because we touch so many lives in amazing ways…. Teachers make a difference every day in a million ways, both seen and unseen. That’s why teaching is worth it!” –Angela R.
” I absolutely love when I make even the smallest difference in a child’s life (academically or emotionally). Having them want to come to school, want to read, want to write, makes me the happiest teacher. I am a teacher and a mother to all of my 20 first grade students.” –Michelle S.
“Teaching is worth it because there are so many children out there that deserve so much more than they have. I want to be that teacher that truly makes a difference in a child’s life. The kind of teacher that helps to steer a child down the right path. It’s worth it to know that I’ve taught students more than academic topics, but that school can be about more than learning. It can be a place of sharing ideas and friendship and trust.” –Karen L.
One of my favorite responses was a heartfelt poem from one of our readers, Jenna Sperling. I asked her permission to share this poem on the blog so all of you can benefit from it! And that, my friends, is why being a teacher is worth it! The next time you begin to question “why”, look at this post and read through all the many reasons why teaching is worth it. It just may remind you why you do what you do, each and every day. 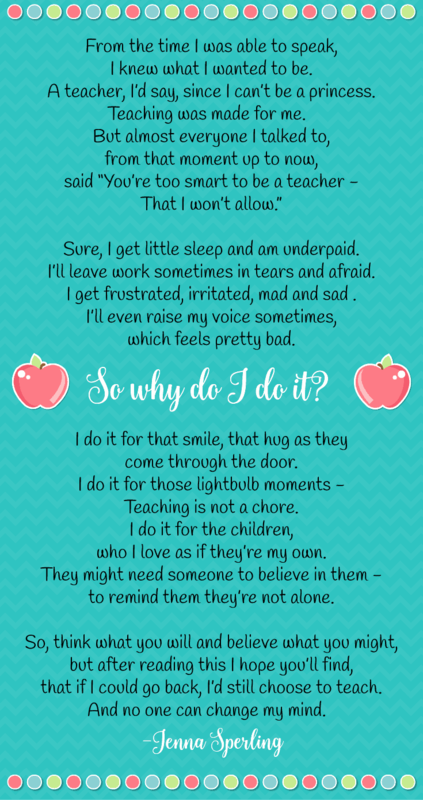 Because at the end of the day… teaching is worth it! Are you a mom, too? 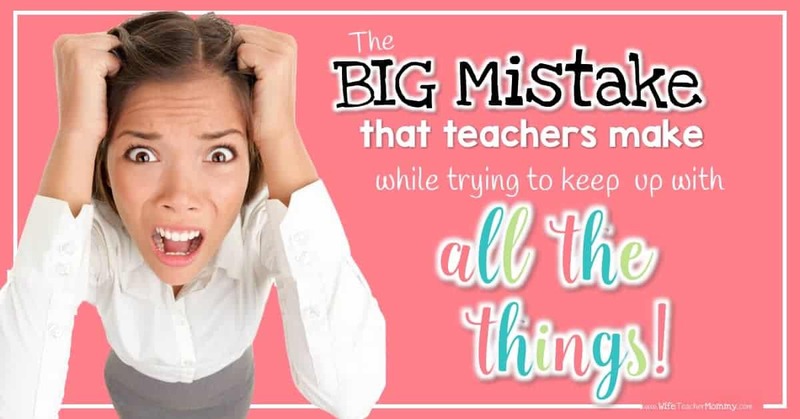 Being a teacher AND a mom can be even more challenging… and even more worthwhile! 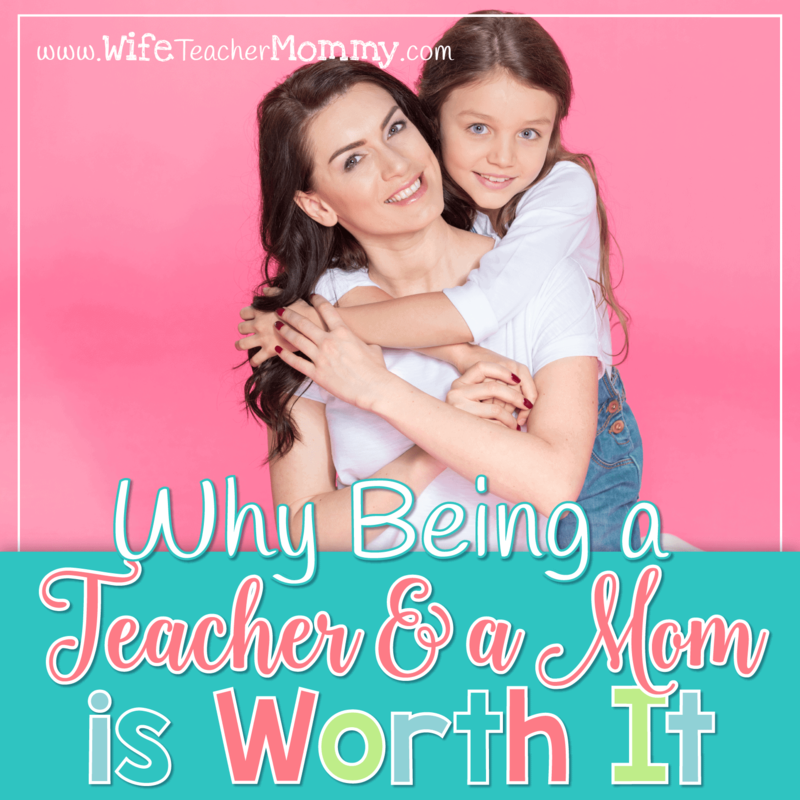 Check out our follow up post: “Why Being A Teacher & A Mom is Worth It?” below! Free Sub Plans & More! 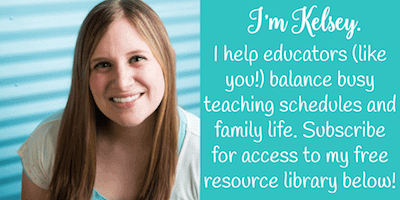 Click here to sign up for the free resource library! 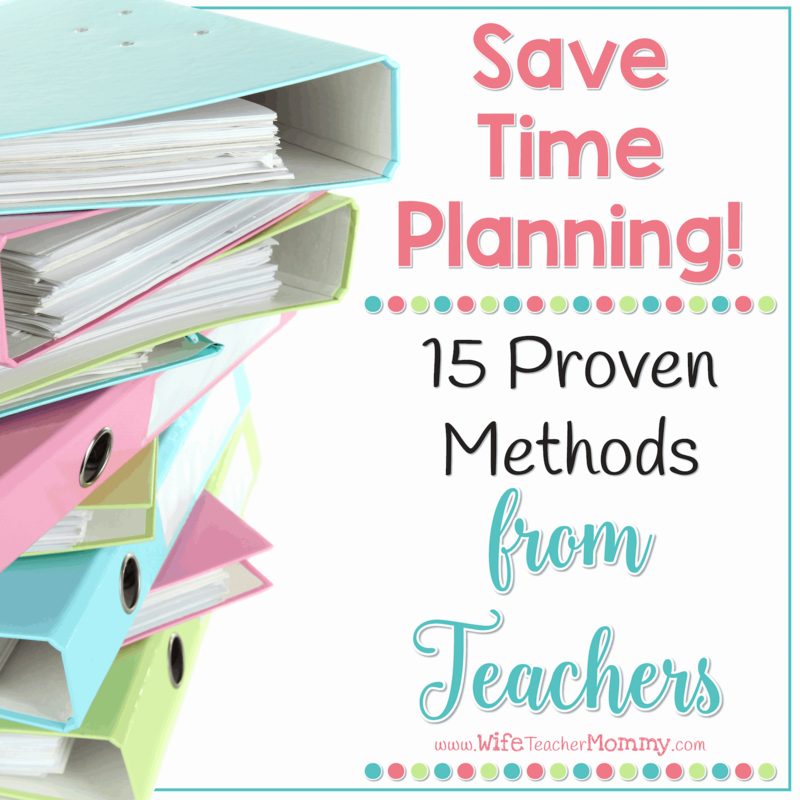 You will gain instant access to free sub plan lessons, sub binder forms, and more!